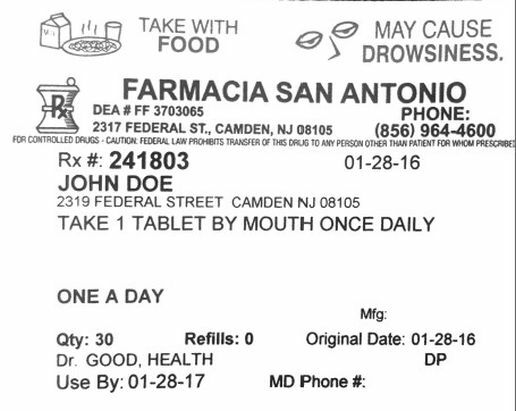 A sample prescription label is provided on the left side to guide you. You will see the Rx Number on the top left hand side. If there is no refill remaining we will need to contact your doctor before we can refill your prescription. It may take up to 48 hours for your doctor to contact us back. Our dedicated team of Pharmacists Team include Raj S, Dave P, Sonali P and Iris B. They together run our independent retail pharmacies in South Jersey. © 2016 Farmacia San Antonio All Rights Reserved.